Public transportation riders in the United States took nearly eight billion trips during the first nine months of 2016. Journeys on buses made up a big part of that number. For each passenger mile traveled, a bus is twice as fuel-efficient as cars, and more than 170 times safer. In fact, public transit use in the United States reduces the nation’s carbon emissions by 37 million metric tons every year. Imagine if New York City, Los Angeles, Washington, D.C., and Atlanta all stopped using electricity for a year – that’s how much power public transit saves annually. Public transit dates all the way back to the 1820s, when horse-drawn double-decker omnibuses could carry up to 42 passengers. Of course, because horses and mules needed to pull the buses, there were limits on how fast and where the buses could travel – not to mention a lot more cleanup! We’ve certainly come a long way since then. Just take a look at some of the modern amenities on buses today. Automated stop announcement, which alerts passengers to when a bus is approaching a stop, is now available on more than 70 percent of buses, up from only 10 percent in 2001. More than 75 percent of buses have exterior bicycle racks, promoting alternate modes of transit. Methods of powering buses has changed, too – more than 40 percent of buses use alternative fuels and hybrid technology, including electricity. Even as other modes of transportation become available, the bus system is still a big part of a city’s public transit infrastructure. In major cities like San Francisco, Houston, and Detroit, bus ridership last year increased from 2015 numbers. Beneficial features help encourage riders to use buses, but the journey to increased ridership may start where your trip begins – at the bus stop itself. Whether you’re waiting one or 15 minutes, your time at the bus stop is valuable. Cities are taking note and are designing bus stops that aren’t just visually pleasing; they’re practical, too. Take Singapore, for instance. The country recently built a bus stop that has a bookstore, swings, and a hanging garden. “We wanted to redesign a commonplace thing we take for granted,” said Seah Chee Huang, Director at DP Architects, the company that designed the stop. The stop takes advantage of technology, enabling riders to charge their phones, scan a QR code to download e-books from the National Library, browse interactive digital boards, and use a journey planner to find the route that’s best for them. There are also updates on the latest weather, news, and city events via solar panel screens around the station. Sometimes, a city will adopt new stations to give their neighborhood a more pleasing aesthetic. The small community of Krumbach – about 1,000 people in the state of Vorarlberg in Austria – decided to update their bus stops so that they would be more visually stimulating for commuters. 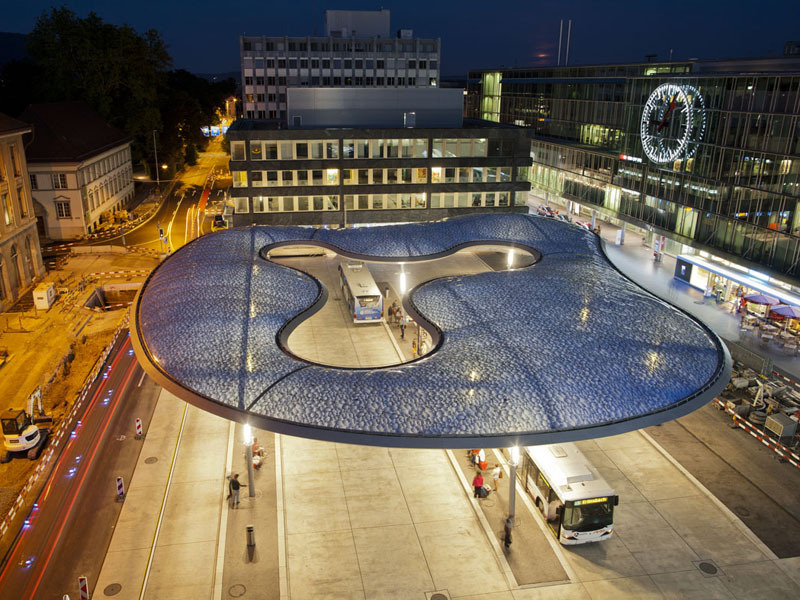 They partnered with architects across Europe and Asia to design seven unique bus stop styles. In cities that experience a lot of rain or snow, having a bus stop that looks nice and serves a purpose for its riders will encourage people to ride. Holland is home to one of the largest structures built entirely out of synthetic materials, a huge piece of polystyrene foam covered in polyester skin. This station provides protection from the elements, and the materials are resistant to knives, cigarettes, and graffiti. As a result, this stop should remain in peak condition for a long time. In Slough, a town in Berkshire, England (and home of the BBC version of The Office), the bus stop represents light’s differing wavelengths. 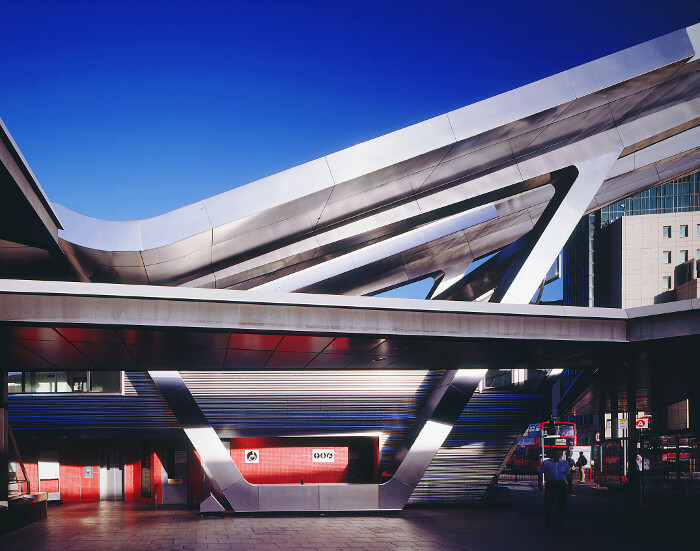 An enormous aluminum curved canopy provides shelter for pedestrians walking from downtown and the railway station, and its look changes depending on the varying light conditions. The two-story structure features a ticket office, newsstand, café, waiting room, and restrooms. 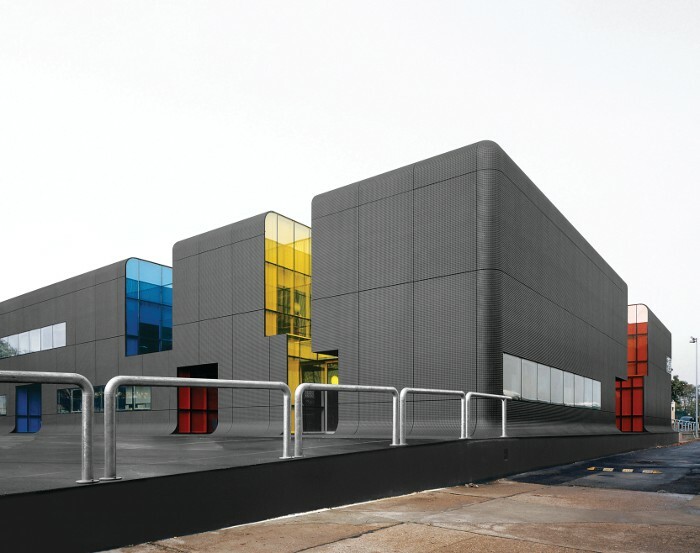 Designs in Germany and Switzerland take their inspiration from a picturesque bunch of clouds, while the Parisian suburb of Thials gives its best impression of Lego blocks by using ductal, a concrete material with a raised texture. These designs help the bus stops stand out among the crowd, making them easily visible for visitors. Maintaining a modern, attractive feel will continue to attract riders as additional forms of transportation become available in cities across the globe. 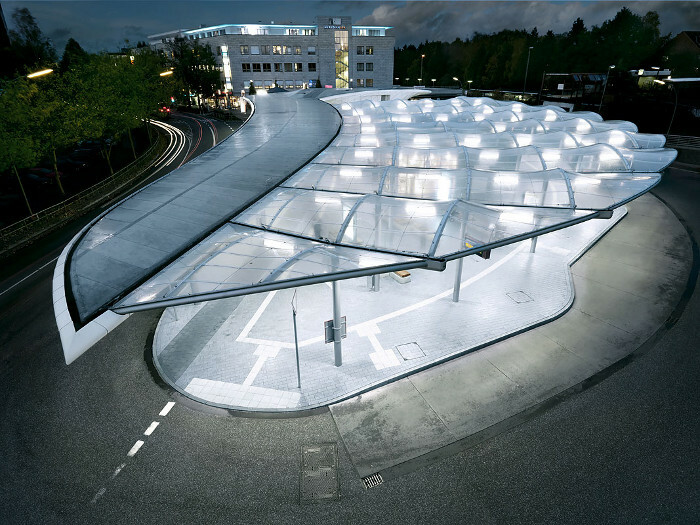 When the sleek look also has function – like London’s Vauxhall bus station, which has a roof layered with photovoltaic cells that help power the station’s lights – riders will get even more benefit. Even with ridesharing and carsharing options, buses remain an integral part of a city’s infrastructure. While focusing on the buses themselves is important, we can’t neglect the stops, either. I’m excited to see what other designs and features architects around the world can develop. 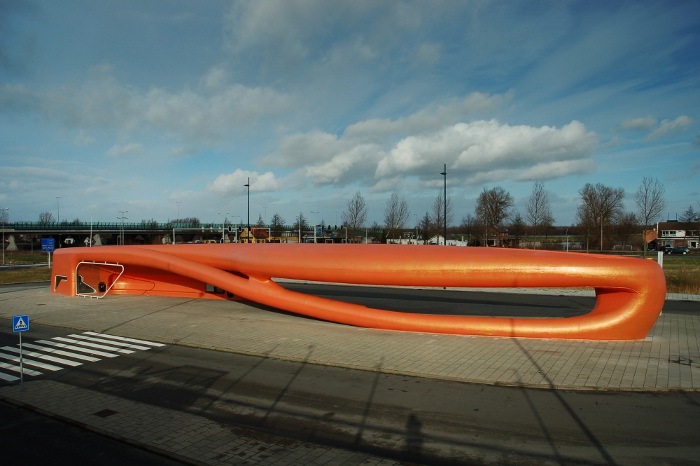 Have you ever been at a particularly impressive bus stop? Connect with us below to let us know! #TransitTrends Episode 5: City Planning – Where Did We Go Wrong?